Visform studio’s Creative Director, Ben Ehlers, a good project design is the difference between securing sales or letting them go to a competing project – and it will come down to a good interior and exterior design to transform potential buyers into secured sales. From fresh succulents to faux ferns, greenery is one of the biggest design trends of 2016 thanks to its ability to instil a sense of calm. To wow purchasers, developers and project designers should extend their use of greenery across both indoor and outdoor spaces. Whether it’s an internal vertical garden or some more subtle touches of green, this design element can be used to complement décor and to create eye-catching designs for common areas and apartment interiors. With the rise in ‘inside-outside living’, purchasers will be impressed by a design that blurs the line between interior and exterior. Think large, floor to ceiling glass sliding doors, identical outside/inside flooring and top-of-the-range exterior amenities – that’s what buyers are looking for. Following on from the importance of exteriors is the demand for large, oversized windows. A great way for residents to soak in the outdoors and add ventilation to their apartment – large windows are a must for any new development in 2016. For an extra touch to get potential buyers over the line, developers and project designers can woo them by using unique materials for the window frames. For example, exposed steel window frames are a great way to add a level of modern sophistication while still maintaining a homely feel to the design. Over the past few years we’ve seen a rise in minimalist design, and that trend is showing no signs of slowing down. Less is still more in 2016, and a clean minimalist design is another design trend buyers are looking for. The trick with maintaining a minimalist feel throughout the project’s design is to choose high-quality materials that will stand out on their own. Designers can also use contrasting features and excess space to keep the design interesting and memorable for potential purchasers. Contrast has been a staple in interior design for years, and the same goes with the 2016 trend of metallic and marble. The unique style of each material combines to create a design that feels modern, sophisticated and completely luxurious – appealing to all potential buyers. For the metallic element, designers should be thinking about brass and gold accents to stay up with the 2016 trend and to add interest in the design. The marble elements will take pride of place and will transform the design with sophistication and luxury. It’s great to have on-trend and fantastic design, but it doesn’t mean anything unless it’s marketed correctly and shown to as many potential buyers as possible – that’s where 2016’s new technology comes in. A great way for developers to market their project and highlight their project design is by creating a lifestyle video that combines drone photography with 3D visualisations. This innovative approach to a project video is a priceless marketing tool – especially when created with an experienced and knowledgeable 3D artist that understands the current design trends. Innovation is a developer’s weapon when it comes to marketing a project, which is why virtual tours are rapidly becoming an integral part of the project’s arsenal. 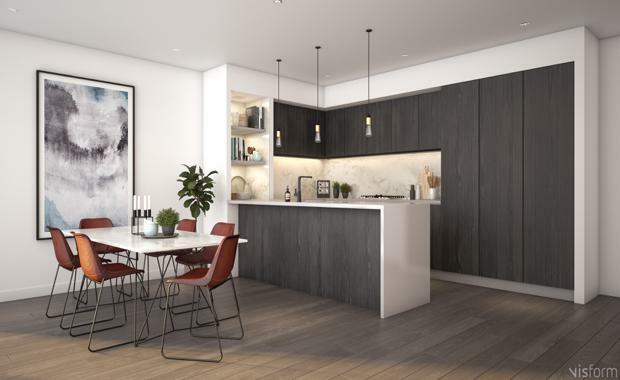 Virtual tours, like the ones offered by Visform’s new 360 Property App, allow potential international and interstate buyers to view the development from anywhere at any time – before construction has even begun. Ben Ehlers is the Creative Director at Visform, a boutique 3D visualisation studio that is a one-stop-shop for all projects’ 3D marketing needs. Focused on providing the highest quality 3D imagery and virtual reality experiences, Visform has experience providing solutions for the property, architectural and design industries. With skills in 3D artistry, architectural knowledge, visual style and photography – Visform ensures they capture each project in the best light. Visform’s new 360 Property App, is an invaluable tool for developers looking to showcase their project across the globe. For more information on how Visform can help with your next project, or to find out more about their app, click here. The Urban Developer is proud to partner with Visform to deliver this article to you. In doing so, we can continue to publish our free daily news, information, insights and opinion to you, our valued readers.